Most of us think that the art of sales resides in just a select few but Daniel H Pink chooses to think otherwise. The bestselling author says we spend a lot of our time cajoling and convincing others to make exchanges with us, such as attention in return for knowledge in the classroom setting. “Once upon a time, only certain people were in sales. Every day, these folks sold stuff, the rest of us did stuff, and everyone was happy. One day, the world began to change. More of us started working for ourselves – and because we were entrepreneurs, suddenly we became salespeople, too,” Pink elaborates. “At the same time, large operations discovered that segmenting job functions didn’t work very well during volatile business conditions – and because of that, they began demanding elastic skills that stretched across boundaries and included a sales component. “Meanwhile, the economy itself transformed so that in the blink of a decade, millions of additional people began working in education and health care – two sectors whose central purpose is moving others. Until finally, in ways we’ve scarcely realised, most of us ended up in sales,” says Pink. Pink is the author of five books that comprise the long-running New York Times bestsellers, A Whole New Mind and Drive, and his latest book, To Sell is Human, which has created waves as a No. 1 New York Times business bestseller, a No. 1 Wall Street Journal business bestseller, and a No.1 Washington Post non-fiction bestseller. 1. Why does everyone need to be a salesperson in his or her career? You’re right that selling has become crucial today. The United States is a case in point. One-in-nine American employee works in sales – that is, his job is to try to convince someone else to make a purchase. But even more importantly, the other eight are also in sales. There’s now data showing that they’re now spending a huge portion of their time persuading, influencing, and convincing others to make an exchange – what I call “non-sales selling.” Like it or not, we’re all in sales now. It’s central to the effectiveness of most white-collar workers – even if they don’t have the word “sales” on their business card or job title. Suppose you’re a boss trying to get your employees to do something different or do something in a different way. That’s sales. Suppose you’re an employee trying to get your boss to free up resources for a project. That’s sales. Suppose you’re trying to get someone to come and work for your company instead of a competitor. Or you’re a teacher trying to convince your students to pay attention in class. Or, a nurse trying to get a patient to change his behaviour. Or an entrepreneur pitching an idea to investors. This sort of endeavour has become central to what we do for a living and how we can become effective. 2. How does one become a salesperson in his/her career? Today, it depends less on duplicity and more on mastering three fundamental qualities. Instead of the ABC’s of Always Be Closing, they need to adopt the new ABCs of Attunement, Buoyancy, and Clarity. These three qualities are the platform for effectiveness in a world where buyers and sellers are more evenly matched. Attunement is perspective-taking, getting out of your own head and seeing things from someone else’s point of view. Buoyancy is staying afloat in an ocean of rejection. And clarity is moving from accessing information to curating it and from solving existing problems to identifying problems customers and prospects don’t realise they have. 3. You say that sales isn’t what it used to be and our basic human nature means many of us are much better at it than we realise. Could you explain this? Sales isn’t what it used to be because of some profound changes in information. Most of what we know about traditional sales comes from a world of information asymmetry – that is, the seller always had more information than the buyer. When the seller holds a huge information edge over the buyer – and the buyer has limited choices and no way to talk back – the seller can take the low road. That’s why we have the principle of “buyer beware.” Buyers had to realise that because their better-informed counterparts could deploy all manner of underhanded tactics. But in the last decade, the information asymmetry that defined the sales relationship has become something closer to information parity. That’s a world of “seller beware” – and it demands new qualities and new tactics that people are only slowly learning. Those qualities tend to be more fundamentally human capabilities rather than the slippery and duplicitous tactics of before. 4. Is the art of negotiation and persuasion something inherent or can it be nurtured? If it can be nurtured, then how can it be done? It’s a fundamental human ability, but it’s one we can improve with practice. Again, I’d begin with the ABCs. How can you get better at understanding others’ perspectives? One way is simply to talk less and listen more. How can you deal with rejection? One way, according to Martin Seligman of the University of Pennsylvania, is to look for ways to explain failure has less personal, pervasive, and permanent effects than it initially seems. How can you take a welter of information and distill it to its essence? One way is to become a genuine expert in your area and work to curate information about that area for followers, customers, and prospects. 5. What advice would you give to young recruits who have just embarked on their career path on how to make their journey a successful one? 1. Hear offers. Even if someone says “no,” embedded in that rejection is often an offer. Listen for it. 2. Say “yes and”. This is fundamental to improvise. Build on others ideas. “Yes but” is destructive. “Yes and” is constructive. 3. Make your partner look good. In negotiation, the idea isn’t to fleece your counterpart. It’s to help him/her get what they want. Attune yourself to the way the other person is thinking. Take their perspective, but bear in mind that this isn’t the same as empathy. Pink explains that perspective-taking isn’t just about understanding their feelings, but also knowing what they’re thinking and what their interests are. An experiments on price negotiation showed that people yield better results when they focus on what the other side is thinking rather than how they are feeling. This insight into their thought processes will put both of you on the same wave length, and guide the discussion to an arrangement that works for both parties. Why not try putting an empty chair in the room to help with the attunement. Amazon.com CEO Jeff Bezos makes this a habit in meetings. “It’s there to remind those assembled who’s really the most important person in the room: the customer,” Pink writes. This is part and parcel of understanding the perspective of the person you’re trying to persuade or convince. Whilst listening is logical advice, Pink says we still make the mistake of focusing on what we’re going to say after they’ve finished speaking. “For many of us, the opposite of talking isn’t listening. It’s waiting. When others speak, we typically divide our attention between what they’re saying now and what we’re going to say next – and end up doing a mediocre job at both,” he writes. “Pumping yourself up with positive self-talk is often not as effective as interrogative self-talk (‘Can you do this?’). Motivating yourself with questions leads to better preparation and is more likely to surface your autonomous, intrinsically motivated reasons for doing a task,” writes Pink. This comes under C of Pink’s ABCs (clarity). There’s a premium on finding problems rather than just solving problems. Selling today is not about steamrolling and pushing a solution. Increasingly, it’s about advising. We’ve moved from selling solutions to selling insights, says Pink. So find the problem that the other person may not even be aware of. Then select a small but effective pool of solutions. This is much more powerful than offering a myriad of choices. We featured this same thought in our September brain issue. Studies show people are more attracted to potential rather than achievement, and say it has to do with the element of optimistic uncertainty. So if you’re selling an idea, or even yourself for a job or a promotion, keep this thought in mind. 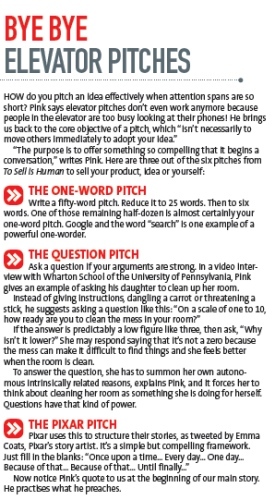 Write a fifty-word pitch. Reduce it to 25 words. Then to six words. One of those remaining half-dozen is almost certainly your one-word pitch. Google and the word “search” is one example of a powerful one-worder. Ask a question if your arguments are strong. In a video interview with Wharton School of the University of Pennsylvania, Pink gives an example of asking his daughter to clean up her room. If the answer is predictably a low figure like three, then ask, “Why isn’t it lower?” She may respond saying that it’s not a zero because the mess can make it difficult to find things and she feels better when the room is clean. To answer the question, she has to summon her own autonomous intrinsically related reasons, explains Pink, and it forces her to think about cleaning her room as something she is doing for herself. Questions have that kind of power. Now notice Pink’s quote to us at the beginning of our main story. He practises what he preaches.